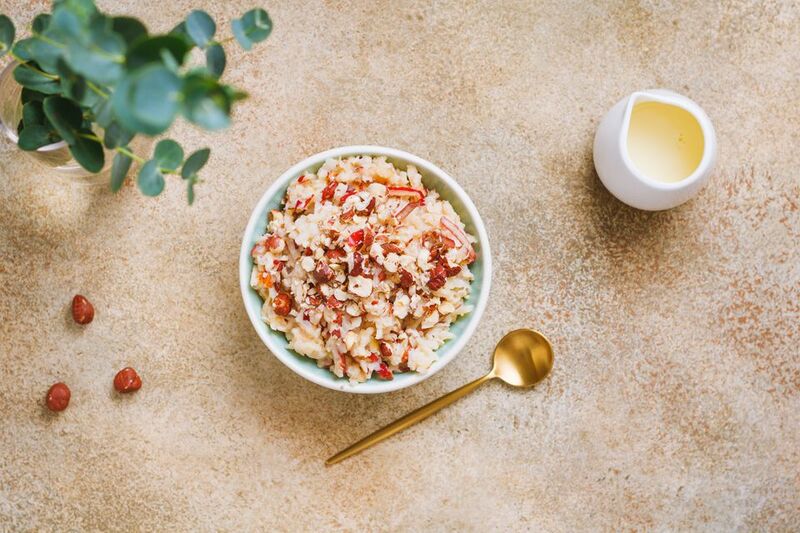 Here is the original Swiss recipe for bircher muesli that was developed around the turn of the last century by Swiss physician Maximilian Oskar Bircher-Benner. The original recipe requires a two-step process. Raw oats are plumped with water in a container overnight. When ready to serve, sweetened milk, grated apple with lemon juice, and chopped nuts are added. It is interesting to note that this original recipe now reflects modern Food Guide Pyramid recommendations set forth by the USDA. Today's idea of muesli has changed over the years to contain a larger portion of oats, less fruit, more grain, more sugar, cream, and dried fruits. And instead of it being a two-step process, "overnight oatmeal" was created by folks in a hurry—all the ingredients are mixed together and refrigerated overnight ready to be eaten as is in the morning, often on the way to work. This breakfast or snack can be gluten-free if made with certified gluten-free oats (always check your label). The proportions used here will make 1 serving but they easily can be doubled, tripled, or quadrupled to accommodate your family. In a small bowl, mug, or Mason jar, mix the oats and water, cover, and let them soften overnight in the refrigerator. If you're in a hurry, oats do not need to be soaked for hours to make them digestible, although other grains do. Add the sweetened condensed milk and stir. Mix the grated apple with lemon juice and then add it to the oat mixture. Sprinkle with raw chopped hazelnuts or almonds and serve. Evaporated milk, cream, or regular milk can be substituted. You also can add 2 teaspoons of sugar to regular milk, or try honey, agave nectar, or stevia if you would like to avoid sugar. People add many other things to this mixture and even serve mix-your-own muesli for breakfast with containers of seeds, grains, and dried fruit set out on the table or buffet. Add a grated carrot, a sliced banana and orange sections to your oats. Soften raisins with the oats. Add flax, sunflower seeds, dried fruit, other rolled grains, yogurt, dickmilch (sour milk/buttermilk), quark or maple syrup to your bowl. Toast the grains before plumping them in water overnight. Make a granola mixture and serve with milk or yogurt and fruit. Add flavorings such as cinnamon, nutmeg, or vanilla sugar or powder. Why Dr. Bircher Created Muesli? In an effort to develop a healthier food and get people to eat more fruit, Bircher, a nutritionist and physician, went against the time's conventional medical practice of thoroughly cooking food. He introduced a small bowlful of uncooked rolled oats mixed with raw apple as an appetizer before most meals. It became a taste sensation and was quickly adopted as a breakfast and snack offering.